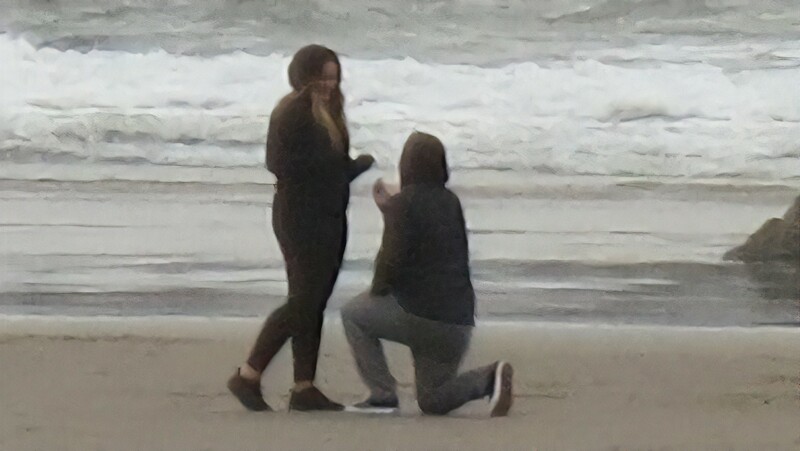 I captured this proposal at Cannon Beach, Oregon, on Saturday, February 24, 2018, around 4:30 pm. I’d love to get the original file to the couple. My family is scattered around the globe today so I decided to go to Cannon Beach, my happy place. I walked to Haystack Rock and The Needles and I took my typical shots from the water’s edge. It was windy and chilly. Not many of us were on the beach. As I had a camera with a telephoto lens,1 I went the back of the beach by the bluffs to get some perspective compression in the image. I stood on a large log for some height and waited for people to leave. After all, how long could they stand in the cold? Not longer than I could, I hoped. A couple of little dogs scampered by with their humans on their leashes. A man walked by with a car wheel over his shoulder. Through it all, a couple just stood there in the way. They hugged and talked and wandered a bit, but never out of the frame. I took some pictures. Maybe I wouldn’t ever get a clear shot so I might as well get one with only a couple of people in it. They might give balance to the composition. And they could provide scale to The Needles. Finally, they walked up the beach and left. Success! I could take the picture I wanted. I was cold so I wandered back to see if Insomnia was still open (nope!) and went into the Jeffrey Hull Gallery. I talked to the man behind the counter. We’ve talked many times before. I told him about my beach adventures and showed him a couple of my pictures and talked about the couple. I said I’d wanted to see a proposal. After all, “It could happen.” Then I left and drove home. I downloaded the pictures on my computer and found this shot. Huh. Look at that! So, I don’t know who the couple is. I don’t know if she said yes. But assuming she did and they’d like the picture, I’d love to get it to them. They can have the original, full-size shot. My gift. Let’s make this happen. I’d appreciate anything you could do to help. Update. Here’s how the AI magic of letsenhance.io imagines a tight crop. 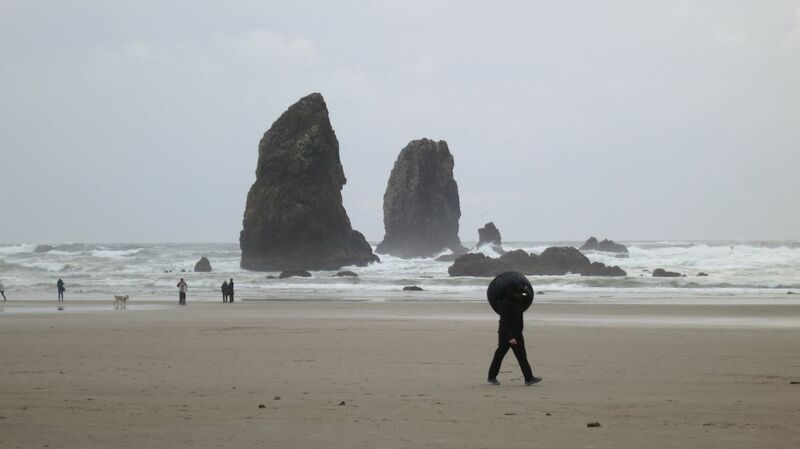 Btw, apparently there was another proposal at Cannon Beach, earlier the same day. I also posted on Instagram and Twitter. Email to your local TV stations!! Hmm… Interesting idea. That would be a lot of potential publicity. I still feel a little strange doing this not knowing what the actual situation was. I’d still like to get the picture to them but I want it to be a happy experience for them, too.